Our employees use a terra cotta-colored modeling clay to take an impression of your pet’s paw. This lasting memorial item will be inscribed with your pet’s name and the year of passing. If you desire, a lock of your pet’s fur can be clipped before cremation or burial. The lock will be placed in a clear ziplock bag for your use in future memorials. If you would prefer burial, but are unable to conduct your services at the time of your pet’s death, we are able to hold your pet for you until arrangements can be made. 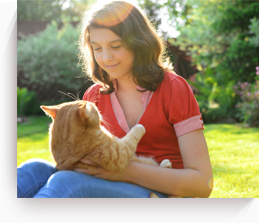 Specific fees will be assessed based on the weight/size of your pet - contact our office today for more details. Cremation of a companion animal without the return of ashes to the family. A certificate of cremation and removal from your veterinarian's office is included. A single pet cremation, where the pet, and only one, companion animal is placed within the retort and cremated during the service. The cremated remains are returned to the family from their companion animal's private cremation service and are placed in a temporary container. A Certificate of private cremation containing the companion animal's paw print and removal from your veterinarian's office is included.